INAUGURAL SA JAZZ FESTIVAL TO BE HELD IN “THE CITY THAT SPARKLES”, KIMBERLEY. Hugh Masekela, Judith Sephuma, Ray Phiri, Stimela, Simphiwe Dana and Oliver Mtukudzi will headline the long awaited inaugural SA JAZZ FESTIVAL which aims to celebrate and honour South African jazz legends. “There is not too many pure and strictly jazz festivals left in the country. This is our first year and we want to create a very unique property that will celebrate this music genre, give jazz lovers a mind-blowing and a memorable experience each year. It has been a dream for long to create this flagship event that showcases SA Jazz tapestry, culture, food and tourist attractions in the Northern Cape,” says the founder and organiser, Somandla Sibisi. 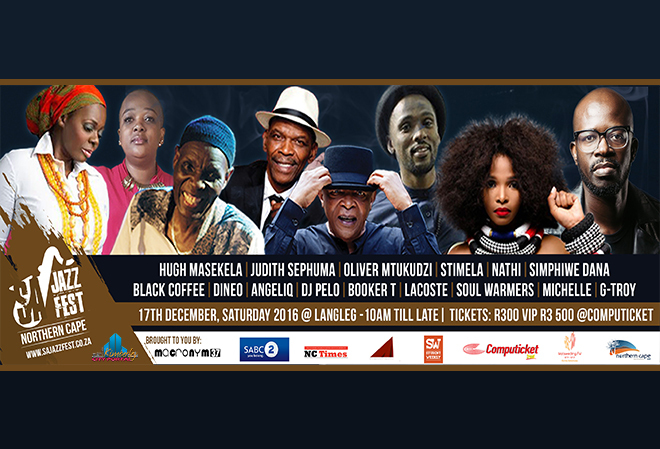 This all South African Jazz affair will take place at Langleg Pleasure Resort on Saturday 17th December 2016. The festival will kick off the Christmas festive season in what will be an annual staple for jazz lovers in South Africa and across the Northern Cape Province. It will be an all-day indulgence of different genres of jazz including up and coming Afro jazz musicians like award winning sensation Nathi Mankayi. As the official home of the new SA JAZZ FESTIVAL, the Northern Cape Tourism is opening its doors for activities to combine and showcase music, culture and cuisine from in and around the province which is home for various cultures; including the famous Khoisan tribe. Did you know that Northern Cape has a number of national and provincial heritage sites, including the archaeological heritage of San (Bushmen) rock engravings? Now this is your chance to visit indigenous communities in the Kalahari just a few kilometres outside the Diamond City. Adventurous excursions like visiting the largest hand-dug hole in the world, known as The Big Hole, will be some of the highlights that come with holiday activities of the rich history of the Northern Cape Province. The SA JAZZ FESTIVAL’s core values are to develop, nurture, empower and showcase local jazz talent too. As a result three local artists and bands will be given an opportunity and a platform to perform among the big names. These include, Deekamo and Dineo. Acclaimed jazz master and singer, Ray Phiri will conduct workshops and presentations for up-and-coming musicians to hone their skills. VIP packages and tickets will be sold at computicket, starting from R300 for general access. SA Jazz Festival is presented by Macronym37.